Homing pigeons navigate by the sun and the earth’s magnetic fields. Photograph © Acclaim Images. Back on October 5, 1998, the same kind of disappearance happened in two American homing pigeon races. In one, about 1,600 pigeons vanished out of 1,800 competing in a 200-mile race from northern Virginia to Allentown, Pennsylvania. The same day, 600 out of 700 birds were missing after a 150-mile race from western Pennsylvania to Philadelphia. On May 28, 2004, the Bismarck, North Dakota office of the U. S. Fish and Wildlife Service began hearing that American White Pelicans were disappearing from the Chase Lake National Wildlife Refuge north of Medina, North Dakota. Two and a half weeks later, 29,000 pelicans wre gone without a trace. See 06/17/04 Earthfiles. American White Pelicans. Photograph by U. S. Fish and Wildlife Service. On top: California brown pelican. 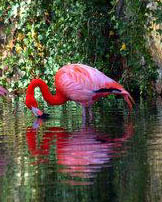 On bottom: Pink Flamingo. Photographs © Acclaim Images. On July 15, 2004, the director general of Tanzania, Afria’s National Parks (Tanapa), Gerald Bigurube reported: “The death of more than 10,000 flamingoes in Lake Manyara is a real tragedy and we are still puzzled with the cause and nature of the mysterious disease that has struck these beautiful creatures.” The suspicion is that there is something wrong with the lake water and flamingo carcasses have been sent to the Leibniz Institute of Fresh Water Ecology and Inland Fisheries in Berlin, Germany, for laboratory testing. 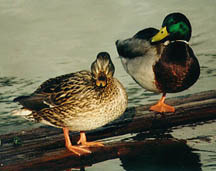 Mallard ducks in United States. Photograph © by Leslie Day. The U. S. Fish and Wildlife Service and Canadian Wildlife Service reported this month that the duck population in the United States and Canada has dropped 11 percent in one year, largely linked to drought that has dried up water in duck breeding grounds. 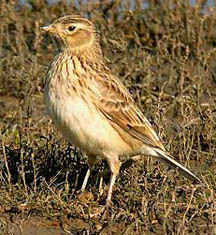 Skylark in Lincolnshire, England. Photograph © 2004 by Roy Harvey. Surveys carried out by the European Bird Census Council, Birdlife International and the UK’s Royal Society for the Protection of Birds (RSPB) in 11 European Union Member States, five accession countries and Norway and Switzerland, reveal that the numbers of twenty-four of Europe’s most familiar bird species have fallen by one third in just a quarter of a century. Across the continent and especially in northwest Europe, where the most intensive agricultural methods are practiced, birds such as skylarks, lapwings and yellowhammers are in decline, the report reveals. The declines pinpointed by the report are most alarming in intensive farming countries such as the UK, where, between 1970 and 1999, skylark numbers declined by 52 per cent, the yellowhammer by 53 per cent and the corn bunting by 88 per cent. I think that there is a lot more going on with birds than anyone knows, only on a more subtle level. I live in central Texas and was very surprised a couple of days ago to see a small flock of robins in our neighborhood park. I walk everyday and have a good familiarity with most of the birds in this part of Texas, so I know them when I see them. Typically, robins spend there winters down this way, then leave in the early spring and head back north. I have never seen a robin in the summer before two days ago. I guess it could just be a fluke, and that some robins just decided to stay on for our wonderfully pleasant summer weather (not!). 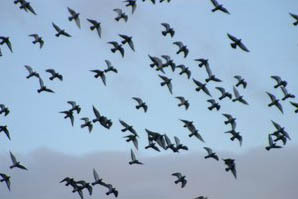 As for the missing birds, they have to be somewhere, which is the real puzzle. Where did they end up? flares in the past year.